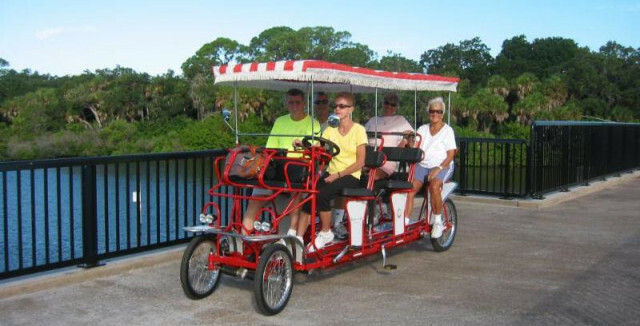 The Friends of the Legacy Trail (FLT) Surrey Ride Program, which offers an opportunity for mobility-challenged residents and visitors “who would otherwise be unable to share in The Legacy Trail experience,” is returning for another season, Sarasota County has announced. Starting Wednesday, Jan. 13, FLT volunteers will be pedaling the surrey and passengers on free, 45-minute trips that will leave from the Sandra Sims Terry Community Center in Laurel Park in Laurel, a news release says. The rides will be offered Wednesdays and Thursdays from Jan. 13 through April 14, with spots available at 9 a.m., 10 a.m., 11 a.m. and noon. Riders may “sit back and enjoy the ride on a four-passenger, four-wheeled, surrey-type bicycle with a canopy cover while FLT volunteers provide the pedal power,” the release adds. Pre-registration is required by visiting www.scgov.net/parks, clicking on “View Activities” and searching for the keyword “surrey,” the release points out. Space is limited to four participants per ride, per time slot, the release notes, and each participant must be willing to sign a waiver. Sun protection is recommended, as well as a light jacket on cooler days and sturdy walking shoes, the release adds. “Registrants must have the ability to climb up one step onto the surrey bicycle,” the release explains. The surrey stop location — the Sandra Sims Terry Community Center — is located at 509 Collins Road in Laurel. Passengers may meet in front of the facility, the release says. “All Sarasota County nature programs prohibit participants from smoking or bringing pets,” the release advises. Further, a ride will be cancelled if it rains and if the weather is very cold, the release notes. For weather cancellation information, call 486-2753. “The Surrey Program has been well received by passengers, and FLT volunteer peddlers have benefited greatly from meeting and visiting with the riders, organizers say in the release. The surrey was a donation from FLT to Sarasota County to promote The Legacy Trail and other county parks, the release points out. “The Legacy Trail is the regional backbone of a recreational and nature-based trail system connecting communities across Sarasota County and stretching into neighboring Charlotte County,” the release adds. “The trail offers several areas to stop, rest, learn about its history or just enjoy the natural beauty” surrounding it, the release says.